There are many products and companies that become profitable based on this principle. Coway purifiers, on the other hand, sell their products based on the exact opposite. What you don’t know can definitely still hurt you, especially if it’s in the very air you breath. The air, though we may not think about it, is filled with microbes, toxins, and allergens. Sometimes the air even carries chemicals that can harm our lungs and impact long-term health. Coway’s Airmega, fights invisible airborne enemies with time-tested filtration and a bit of tech. The Airmega 400s is a sleek and modern workhorse for your home. To start, it offers real-time air quality monitoring. Air quality will never be in question with the 400s because it offers real-time updates through an LED indicator ensuring you know your air is as clean as it should be. This heads up air monitoring system tag teams with the AirMega’s smart mode features. With smart mode, this air purifier adjusts fan speed based on air quality and lighting. All while adjusting air filtration rates according to air quality. It doesn’t matter how clean the air in your home is though if your purifier is running inefficiently and sucking up electricity while hiking up your bill. Coway thought of that too. In Smart Eco mode, the 400s will shut itself down once the air quality has remained stable for 10 minutes. Should allergens or other unwanted microbes float in, the fan will kick back on automatically, keeping those airborne pests from hanging around. Topping off the features, the 400s connects over WIFI to an app on your mobile device. This enables the owner to know the air quality in the home while away, as well as set timers. Bells and whistles are nice, but they don’t matter a whole lot if the machine they’re on doesn’t actually do its job. The Airmega 400s isn’t just a smooth talker, it walks the walk too. Boasting two filters with the ability to cover a 1,500 square foot home, this air purifier does a great job for the price. It has a true HEPA filter and activated carbon, and on top of it all keeps quiet while doing the job. The noise level of this sleek machine comes in at 22-52 dB depending, even quieter than BlueAir’s comparable 605 air purifier. Rounding off this great piece of tech is the look. With a sleek and space efficient design, this machine would be a compliment to any modern home. While the 400s is a great piece of equipment, especially considering the price, it can’t do everything. The Airmega has two filters but combines carbon and HEPA in one filter element. While this is great for ease of use, those who are looking for a little more longevity from their filter may want to keep this in mind before buying. 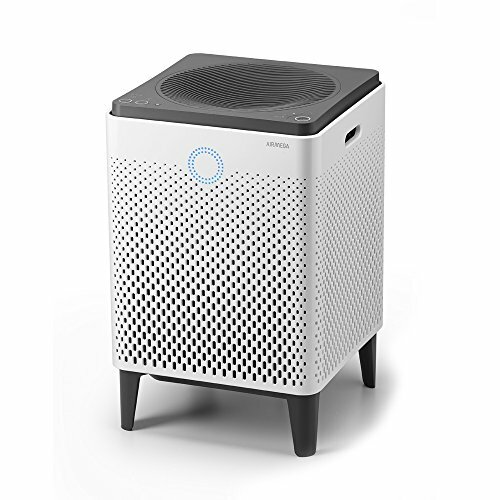 For the long haul, Austin Air offers a model with four-sided filtration, and it’s true HEPA measures about 60 square feet, with carbon filters containing up to 15 pounds of activated carbon. The 400s is also an air purifier on the more expensive end of the spectrum. For a comparable but cheaper option, Coway also has the Airmega 300s for around 100 dollars less. All things considered, the Airmega 400s is a powerful piece of equipment. It’s loaded with useful features and capable of filtering an incredibly large space efficiently, all while looking good. If you’re keen on breathing cleaner air, the Airmega 400s is an excellent all around player. It doesn’t skimp on quality or performance. And, the tech they use actually works. RELATED: Looks great, but does the Dyson actually work?